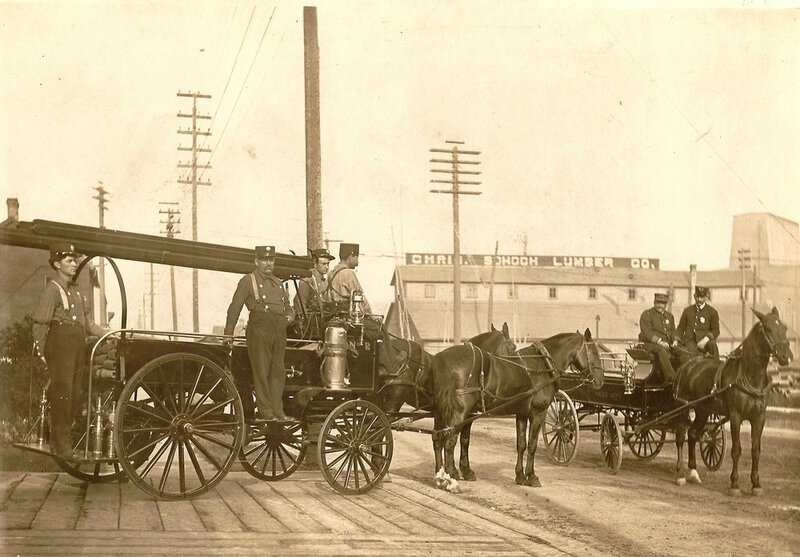 Horse-drawn engines played a large roll in putting out fires when the city of Manitowoc and surrounding areas were threatened in October, 1871. This undated photo was taken near the front of south side firehouse at 911 Franklin St., Manitowoc. One Two Rivers family found their wells dry and threw the contents of their pickle barrels onto their outbuildings to save them from the fire. Only one log building was destroyed and family history has said that deer later came to eat the pickles. The community of Maple Grove publically posted a list of losses that included “500 bushels wheat and oats and 15 tons hay… $1,000,” and “barn, grain, and hay… $1,200. The farmers with insurance were fortunate as many did not carry insurance at the time. It began to rain on October 9 and fires were slowly extinguished. Many relief supplies were brought north, but one ship brought clothing, blankets, and food to the residents of Two Creeks, Mishicot, Cooperstown, and Gibson. At Two Creeks the Andy Johnson from Milwaukee brought 11 boxes of girl’s clothing, two boxes for women, two for men, and two for boy’s clothing. There was also a box of shoes and quilts.